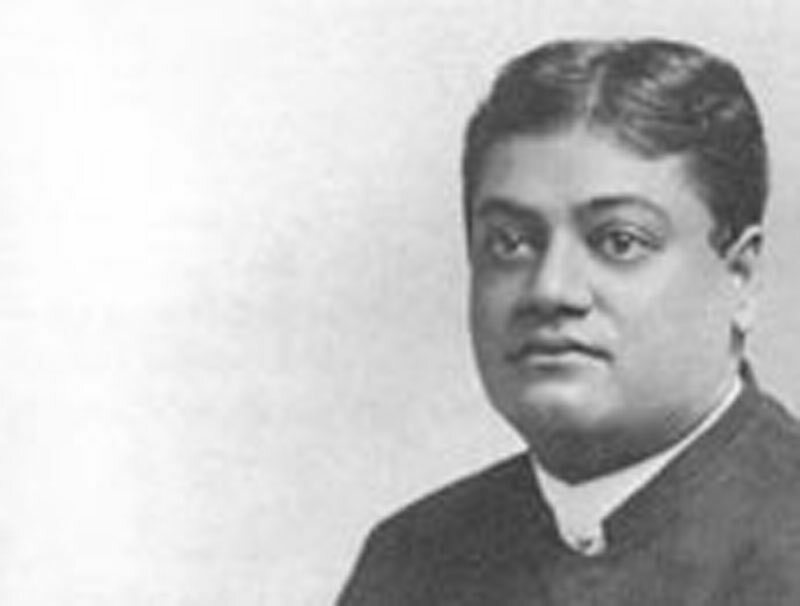 Hindus and Christians Teachings of Swami Vivekananda by Topic- Frank Parlato Jr.
Of the different philosophies, the tendency of the Hindu is not to destroy, but to harmonise everything. If any new idea comes into India, we do not antagonise it, but simply try to take it in, to harmonise it, because this method was taught first by our prophet, God incarnate on earth, Shri Krishna. This Incarnation of God preached himself first: "I am the God Incarnate, I am the inspirer of all books, I am the inspirer of all religions." Thus we do not reject any. There is one thing which is very dissimilar between us and Christians, something which we never taught. That is the idea of salvation through Jesus' blood, or cleansing by any man's blood. We had our sacrifice as the Jews had. Our sacrifices mean simply this: Here is some food I am going to eat, and until some portion is offered to God, it is bad; so I offer the food. This is the pure and simple idea. But with the Jew the idea is that his sin be upon the lamb, and let the lamb be sacrificed and him go scot-free. We never developed this beautiful idea in India, and I am glad we did not. I, for one, would not come to be saved by such a doctrine. If anybody would come and say, "Be saved by my blood", I would say to him, "My brother, go away; I will go to hell; I am not a coward to take innocent blood to go to heaven; I am ready for hell." So that doctrine never cropped up amongst us, and our prophet says that whenever evil and immortality prevail on earth, He will come down and support His children; and this He is doing from time to time and from place to place. And whenever on earth you see an extraordinary holy man trying to uplift humanity, know that He is in him. So you see that is the reason why we never fight any religion. We do not say that ours is the only way to salvation. Perfection can be had by everybody, and what is the proof? Because we see the holiest of men in all countries, good men and women everywhere, whether born in our faith or not. Therefore it cannot be held that ours is the only way to salvation. "Like so many rivers flowing from different mountains, all coming and mingling their waters in the sea, all the different religions, taking their births from different standpoints of fact, come unto Thee." This is a part of the child's everyday prayer in India. With such everyday prayers, of course, such ideas as fighting because of differences of religion are simply impossible. So much for the philosophers of India. We have great regard for all these men, especially this prophet, Shri Krishna, on account of his wonderful catholicity in harmonising all the preceding revelations. Then the man who is bowing down before the idol. It is not in the same sense as you have heard of the Babylonian and the Roman idolatry. It is peculiar to the Hindus. The man is before the idol, and he shuts his eyes and tries to think, "I am He; I have neither life nor death; I have neither father nor mother; I am not bound by time or space; I am Existence infinite, Bliss infinite, and Knowledge infinite; I am He, I am He. I am not bound by books, or holy places, or pilgrimages, or anything whatsoever; I am the Existence Absolute, Bliss Absolute; I am He, I am He." This he repeats and then says, "O Lord, I cannot conceive Thee in myself; I am a poor man." Religion does not depend upon knowledge. It is the soul itself, it is God, not to be attained by simple book-knowledge or powers of speech. You may take the most learned man you have and ask him to think of spirit as spirit; he cannot. You may imagine spirit, he may imagine spirit. It is impossible to think of spirit without training. So no matter how much theology you may learn — you may be a great philosopher and greater theologian — but the Hindu boy would say, "Well, that has nothing to do with religion." Can you think of spirit as spirit? Then alone all doubt ceases, and all crookedness of the heart is made straight. Then only all fears vanish, and all doubtings are for ever silent when man's soul and God come face to face. A man may be wonderfully learned in the Western sense, yet he may not know the A B C of religion. I would tell him that. I would ask him, "Can you think of spirit as such? Are you advanced in the science of the soul? Have you manifested your own soul above matter?" If he has not, then I say to him, "Religion has not come to you; it is all talk and book and vanity." But this poor Hindu sits before that idol and tries to think that he is That, and then says, "O Lord, I cannot conceive Thee as spirit, so let me conceive of Thee in this form"; and then he opens his eyes and see this form, and prostrating himself he repeats his prayers. And when his prayer is ended, he says, "O Lord, forgive me for this imperfect worship of Thee." You are always being told that the Hindu worships blocks of stone. Now what do you think of this fervent nature of the souls of these people? I am the first monk to come over to these Western countries — it is the first time in the history of the world that a Hindu monk has crossed the ocean. But we hear such criticism and hear of these talks, and what is the general attitude of my nation towards you? They smile and say, "They are children; they may be great in physical science; they may build huge things; but in religion they are simply children." That is the attitude of my people. One thing I would tell you, and I do not mean any unkind criticism. You train and educate and clothe and pay men to do what? To come over to my country to curse and abuse all my forefathers, my religion, and everything. They walk near a temple and say, "You idolaters, you will go to hell." But they dare not do that to the Mohammedans of India; the sword would be out. But the Hindu is too mild; he smiles and passes on, and says, "Let the fools talk." That is the attitude. And then you who train men to abuse and criticise, if I just touch you with the least bit of criticism, with the kindest of purpose, you shrink and cry, "Don't touch us; we are Americans. We criticise all the people in the world, curse them and abuse them, say anything; but do not touch us; we are sensitive plants." You may do whatever you please; but at the same time I am going to tell you that we are content to live as we are; and in one thing we are better off — we never teach our children to swallow such horrible stuff: "Where every prospect pleases and man alone is vile." And whenever your ministers criticise us, let them remember this: If all India stands up and takes all the mud that is at the bottom of the Indian Ocean and throws it up against the Western countries, it will not be doing an infinitesimal part of that which you are doing to us. And what for? Did we ever send one missionary to convert anybody in the world? We say to you, "Welcome to your religion, but allow me to have mine." You call yours an aggressive religion. You are aggressive, but how many have you taken? Every sixth man in the world is a Chinese subject, a Buddhist; then there are Japan, Tibet, and Russia, and Siberia, and Burma, and Siam; and it may not be palatable, but this Christian morality, the Catholic Church, is all derived from them. Well, and how was this done? Without the shedding of one drop of blood! With all your brags and boastings, where has your Christianity succeeded without the sword? Show me one place in the whole world. One, I say, throughout the history of the Christian religion — one; I do not want two. I know how your forefathers were converted. They had to be converted or killed; that was all. What can you do better than Mohammedanism, with all your bragging? "We are the only one!" And why? "Because we can kill others." The Arabs said that; they bragged. And where is the Arab now? He is the bedouin. The Romans used to say that, and where are they now? Blessed are the peace-makers; they shall enjoy the earth. Such things tumble down; it is built upon sands; it cannot remain long. Everything that has selfishness for its basis, competition as its right hand, and enjoyment as its goal, must die sooner or later. Such things must die. Let me tell you, brethren, if you want to live, if you really want your nation to live, go back to Christ. You are not Christians. No, as a nation you are not. Go back to Christ. Go back to him who had nowhere to lay his head. "The birds have their nests and the beasts their lairs, but the Son of Man has nowhere to lay his head." Yours is religion preached in the name of luxury. What an irony of fate! Reverse this if you want to live, reverse this. It is all hypocrisy that I have heard in this country. If this nation is going to live, let it go back to him. You cannot serve God and Mammon at the same time. All this prosperity, all this from Christ! Christ would have denied all such heresies. All prosperity which comes with Mammon is transient, is only for a moment. Real permanence is in Him. If you can join these two, this wonderful prosperity with the ideal of Christ, it is well. But if you cannot, better go back to him and give this up. Better be ready to live in rags with Christ than to live in palaces without him.